“Infinite Banking” and Real Estate Investing – Innovative Retirement Strategies, Inc. Many people researching the use of Life Insurance for real estate investing will undoubtedly think that “Infinite Banking” or “Bank on Yourself” are the same thing as what we’ve discussed here. They are NOT. When an investor is leveraging the cash value of a life insurance policy to invest in real estate, it is paramount that the policy have as much cash value as possible. If the Death Benefit is too high, the premium goes towards higher fees and commissions for the agent. You can see this in the ratio of Premium to Cash Value on your illustration. If your illustration is not showing the 1st Year Cash Value at least 85% of the 1st Year Premium, the agent is not designing it for maximum cash value. Period. The death benefit, and the agent’s commissions, are too high. Infinite Banking is a life insurance marketing system. It is based on the same idea of leveraging cash value as discussed here. But their policies are are NOT not designed for the maximum amount of cash value. They leave room for the policy owner to add more cash value later in the form of Paid-up Additions (read: more premium). If you put $1.00 of premium into a policy, would you want a policy with 65-cents of cash value or one with 85-cents of cash value? When you are planning to leverage cash value to invest in real estate, it is imperative that the cash value to premium ratio be maximized. The red line shows a policy with 85% cash value to premium and the blue line shows one with 65%. At a 7% return on the cash value, it takes over 6 years for the cash value just to get back to the amount paid in premium! The properly-designed policy takes only 2 years. Bottom line: There is a spectrum that extends from the least possible price that you can pay for a set amount of death benefit to the most that you can possibly pay for a set amount of death benefit. A basic Whole Life or Guaranteed Universal Life policy is a good example of a Minimally-funded policy. They represent the least cost way to get the most coverage. They’ll also have the least amount of cash value. An over-funded policy is the polar opposite. It is the Most that you can possibly pay for any given death benefit. THAT is the policy design that will have the greatest cash value. 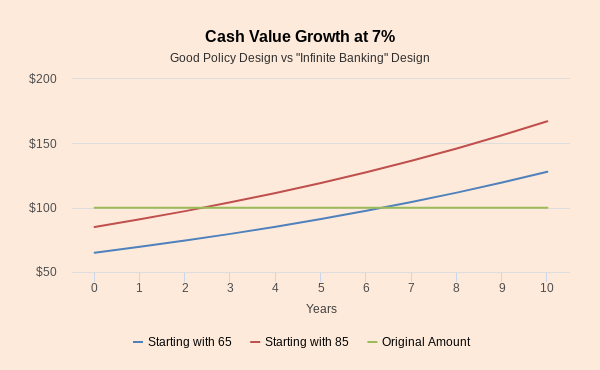 “Infinite Banking” and the other Life Insurance Marketing Systems are certainly high cash value policy designs, but they are not designed to the maximum limit. Be sure to check out Life Insurance 101 for a basic understanding of how permanent insurance works and what the cash value in a policy represents.